Before you start gobbling delicate corn tortillas topped with salty, tasty meat in the taquerias of central Mexico, you get to crown your snack with your choice of several salsas, often including what may be my favorite taco condiment of all time: guacamole taquero. 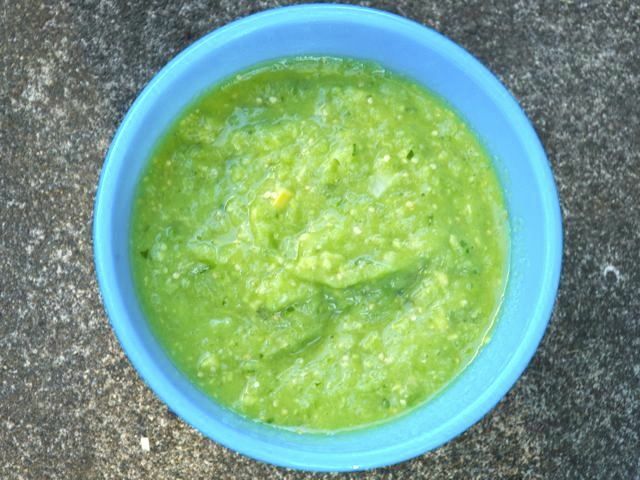 Blurring the line between guacamole and salsa, this smooth blend of creamy avocado and tart tomatillos packs a spicy punch from serrano chiles and a hint of pungent epazote (many cooks add cilantro instead and so can you). I'll put this on just about any imaginable taco, but it's especially amazing spooned over those filled with carnitas, steak, and grilled cactus. Put the tomatillos into the blender jar first, then add the epazote, garlic, onion, chiles, lime juice, and salt. Blend until very smooth, at least a minute (be patient). Scoop the avocado flesh with a spoon into the blender jar and blend until smooth. Add a little water, if necessary, to achieve a pourable texture. Season to taste with additional chile, lime juice, and salt, and blend once more. This salsa tastes best the day it's made, but the acidity of the tomatillos will keep it from discoloring as quickly as most guacamoles. It'll still be delicious the next day if you store it in the refrigerator with a piece of plastic wrap pressed against the surface. Let it come to room temperature before you serve it.